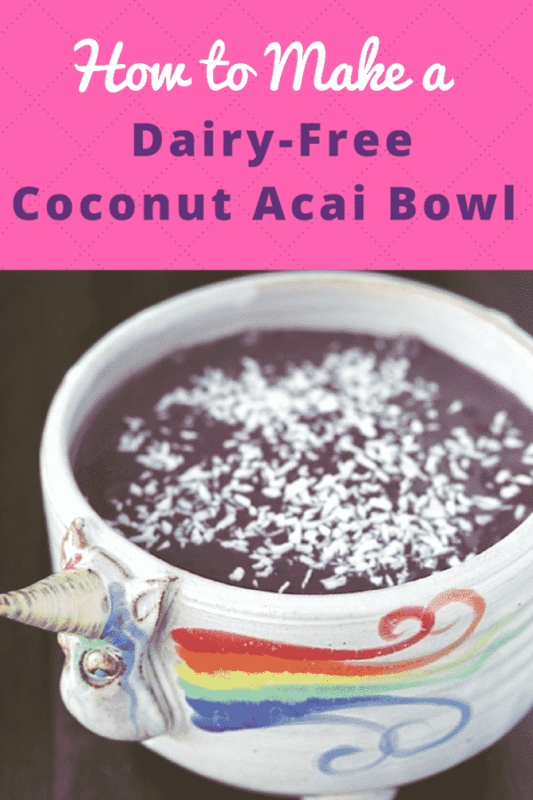 I’m not sure what is better about this Dairy-Free Coconut Acai recipe, its vibrant purple color or its amazing superfood powers! 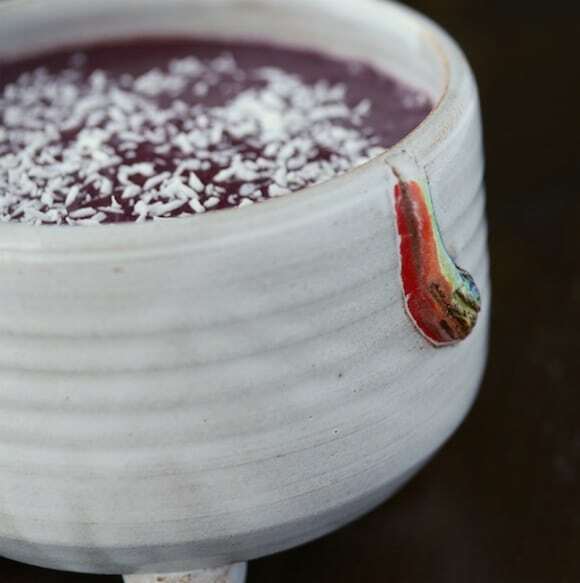 Acai puree isn’t something I’ve used in the past, mostly because the brand I saw at the store had added ingredients like sugar and herbal ingredients I didn’t recognize. 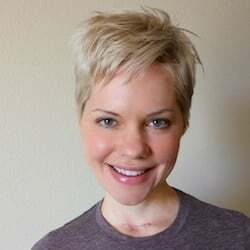 I had more recently heard Joy and Jay interviewed on Bulletproof Radio and was so impressed with their knowledge of using superfoods and herbs in super-powered recipes. Joy was kind enough to send me a copy of their cookbook and I actually read it cover to cover, finding inspiration on each and every page. I’ll admit that many of the recipes need ingredients that I do not have, but I’m taking baby steps to incorporating some of the products they recommend. I love that there is a big section at the beginning of the book that describes the various superfoods in detail. 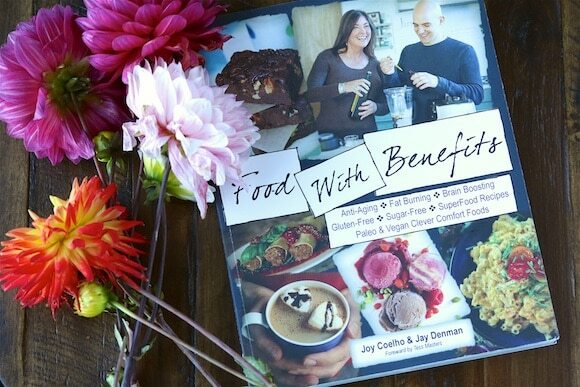 And, of course, the book is made up entirely of recipes using those ingredients, including desserts, main dishes, smoothies, soups, baked goods, and beverages. 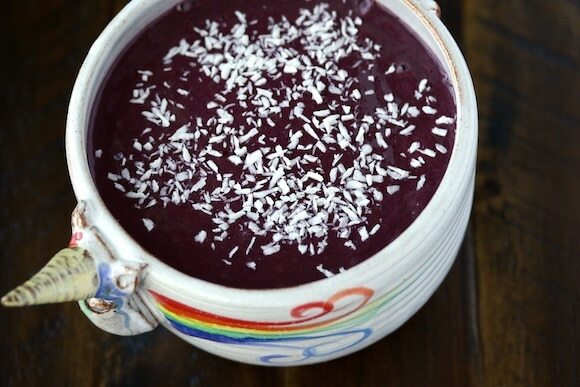 For now, the book inspired me to make my very first acai bowl (acai is purported to have anti-inflammatory properties). I adapted the recipe from the book using the ingredients I had, plus for some of my preferences (for example, all of the recipes in the book are sugar-free, but I can’t tolerate non-nutritive sweeteners, so I ended up using a little bit of maple syrup). I also left out all of the other optional ingredients because I didn’t have them on-hand, but they included items like rose water, and E3Live Blue Majik Powder. 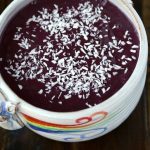 This recipe is inspired by the Acai Triple Berry “JingLato” from the “Food With Benefits” cookbook. Combine ingredients in a high-speed blender and process until smooth. Serve cold. Full disclosure: this is not a sponsored post, but I received a complimentary copy of the cookbook from Joy and the bowl from Uncommongoods.com. All opinions are my own. Don’t miss a recipe! Sign up here to receive my weekly newsletter with dairy- and gluten-free seasonal recipes and inspiration. The bowl for sure!! Just where did you ever find it? 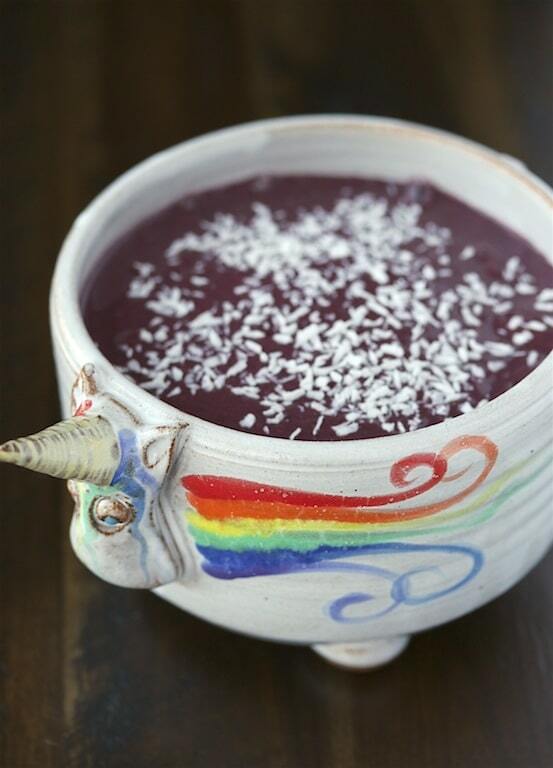 That acai bowl is surely amazing. Looks yummy too! Thanks Carrie for sharing this recipe! Hi! This looks delicious. What are the benefits of sunflower and soy lecithin powder…? I think it’s for texture, but you can leave it out!